Childhood Vaccinations: Where Do You Stand? The recent outbreak of measles in Disneyland has sparked a lot of interesting articles, videos and debates about vaccinations. This lesson has students researching both sides of this important issue, looking at the pros and cons of each, and then taking a stand on their position and writing a letter of persuasion to the opposite viewpoint. Ask students what vaccines are, why we get them and how they work. Explain if necessary that vaccines are protection against diseases, so that we don’t get the disease, and they work by injecting a weak amount of the disease so that we can build up an immunity to it so we don’t get sick. View this Ted-Ed video to understand how. View this news clip about the recent measles outbreak at Disneyland to illustrate what can happen if we don’t get vaccinated. Ask students what type of illnesses children get vaccinated for. Have them look up the immunization schedule using KidsHealth website and completing the “Childhood Immunization Chart” found below. 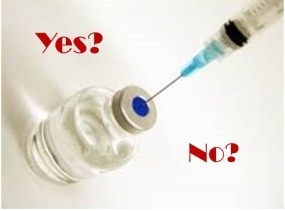 Ask students whether vaccinations are voluntary or mandatory and after discussing that the answer could be both depending on the circumstances like entering public schools or religious reasons and then view the YouTube clip titled Should Vaccinations be Mandatory? Discuss every year there are more and more parents refusing to have their children vaccinated. Why? Is this a good or bad idea for the child? Community? (After all, these vaccines are for contagious diseases.) View this debate between two mothers. Students will then explore the pros and cons of vaccinations using assigned readings and complete the graphic organizer. See below. Finally, students will use their graphic organizer to write a letter of persuasion to their opposing view point. They just need to choose the template they are writing their response to.